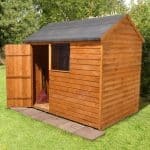 This is a shed that will easily blend into any style of garden and become an essential part of it. The 6′ x 4′ Windsor Somerset Double Door Wooden Garden Shed offers a very good amount of storage space, but at the same time does not require a large garden to set up home in. It just has such a high class and stand out look that as well as offering a place to keep all of your garden items, tools or even kids outdoor toys, it will become an actual feature of your garden. In addition, because of the excellent materials it is comprised of will be something you can make use of for many years to come. The tongue and groove shiplap cladding may be very attractive, but it also serves as the ultimate protection for your belongings against the rain. This along with that lovely, apex style roof will make it so anything you store in here stays dry, safe and also away from any nosey neighbours who like to peek over the garden fence. This is a very well designed shed that would be perfect for a person looking to keep all their gardening tools tidy, or even a family looking for that extra bit of storage space. Here we have the 6 X 4 Windsor Somerset Double Door Wooden Garden Shed and let us tell you that it is simply impossible not to run your hand across its smooth walls the first time you see it and give a very approving nod of your head. 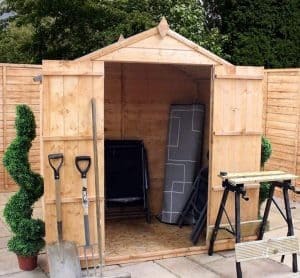 This is a shed that looks smaller than it really is, but the compact overall design means it will fit most gardens, even if you are short on space. However, once you open the doors you will be impressed with the amount of storage space on offer here. The depth of the shed is right around 4 feet and the width is a very spacious, 6 feet. This with some planning on your part is more than enough space for the average garden. There is a good amount of height on this shed with the ridge offering 6 feet 11 inches of height right down the middle so you have a good walkway. Even the lowest section of the shed is 5 feet 6 inches which is rather impressive also. In all this shed offers a good amount of storage space and it does it with some very cool modern style. The roof of this shed is just so well designed and we are talking from a practical point of view and also from a design point of view. The apex roof has just such a well thought out design that it really does become the standout feature of the shed. This is one of the best styles of roof out there for keeping the rain out. Windsor are using some good, reliable roofing felt to protect the 8 mm solid sheet roof boards that are underneath. We are very impressed with the roof here, as Windsor have really managed to make it stand out and look amazing without affecting its ability to keep out the rain. To say that we love this cladding is an understatement. This is tongue and groove shiplap cladding and it covers the whole shed offering it an immense amount of protection from the elements, as well as looking fantastic in the process. 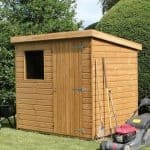 The cladding is a very respectable 12 mm thick and we have seen sheds at double this price with cladding not as good looking or durable as what is offered here. The cladding really does give the shed such a high class and top of the line look that people will be surprised when you tell them that it was under £500, let alone £300. We really cannot think of a single style of garden where this would look out of place. 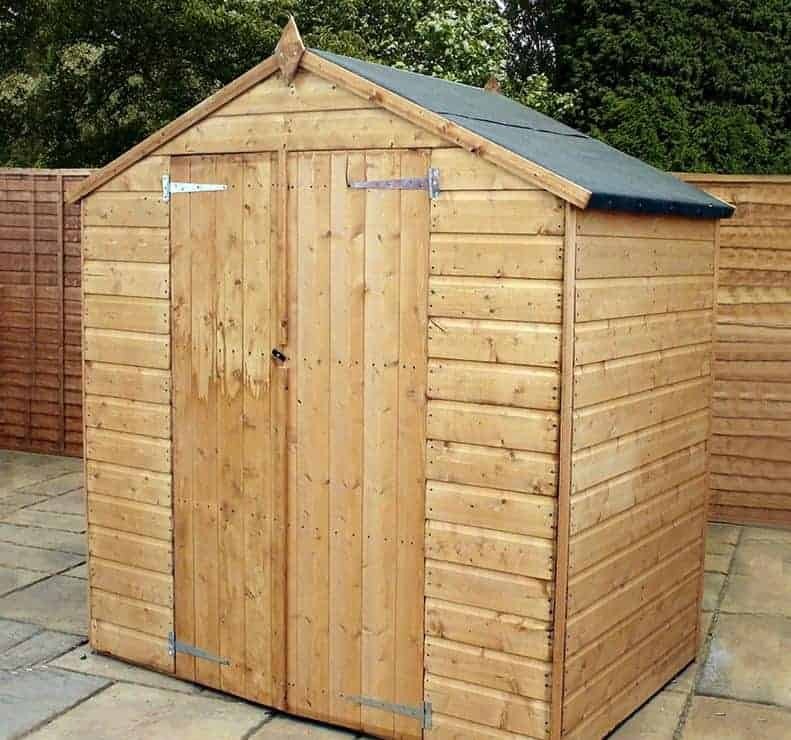 The cladding on its own already makes this a shed that will stand up against the bad weather, keep your items dry and spruce up your garden in the process. The frame is a solid, 27 x 32 mm and it does give the shed just such a strong set of bones that add to the high quality feel, but also makes it so the shed will stay sturdy for many years. People underestimate just how important the frame is, but we are glad to see that Windsor made sure to put a top quality frame in here. The flooring of the 6′ x 4′ Windsor Somerset Double Door Wooden Garden Shed has been designed to be able to hold quite a lot of weight and with this being a shed that can handle a lot of things that is a good thing. The floor uses those same style boards that are in the roof, but these ones are a little bit thicker at 10 mm, so they are a little bit stronger in order for them to be able take more weight. Underneath the flooring we have some 28 x 28 floor joists which give the floor that little bit extra strength and prevent the floor from feeling too bouncy. The shed will be delivered to you having been dipped in treatment. This is enough to protect the shed in the move, but once you have built it, you will be best off treating it right away. 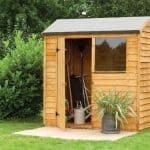 Treating your shed once per year should be something that you get into the habit of too. You do this and the shed will be there for you, standing strong and looking great for a lot of years. 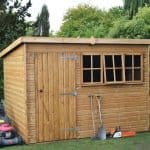 Windsor offer a ten year anti rot guarantee and we think that is just great, but to make use of this guarantee, you will need to make sure you have treated the shed once per year as instructed to make the warranty valid. To save the stress and potential sore fingers from trying to get something into a tiny, little door, Windsor have installed a large double door right in the middle of the shed. This is a great looking door and is held in place by a set of four silver coloured, door hinges. These doors, when open, offer a lot of space to move things into and out of the shed. They are 3 feet 2 inches wide and 5 feet 5 inches high. This should make it so even getting in something as large as a set of shelves will not be any hassle. While there are no windows on the shed we actually feel that this is a good thing. The fact that the cladding makes up the whole shed does give it a very unique style and we think a window would have taken away from this. 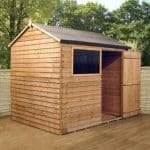 This is a shed that is strong and reliable and we certainly have no concerns over the general quality of the shed. But it does not come with any kind of lock, instead having a button catch. This does keep the doors closed, but if you want to add some security then we recommend a padlock or some other style of lock. This can be done cheaply and easily so is not a big deal. The lack of windows adds to the overall design of the shed, but we also feel that it gives you a great amount of privacy as there is no way when the doors are closed that people can see inside and know what awesome stuff you have! To add a little bit extra storage space then you could add in some shelves on the back or side walls. Also there is a number of different colours of wood treatment out there if you want to give the shed a bit more of your personal style. The whole of this shed just screams high quality. Everything about it has been designed very well and made from reliable materials to make it feel like a much higher priced shed. The apex roof and shiplap cladding have been expertly made and made to last. When built right this is a shed which will still be standing many years from now. 6 X 4 may not sound like a lot of storage space on paper, but if you plan out how you are going to store your items, you will be amazed at how much you can fit in here. Add a few shelves to the walls if you really want to get the most storage space possible. You will need a friend or family member to help install the shed, but if you follow the instructions, take your time and try to enjoy the process then you will have the shed built in around 2-4 hours and also a feeling of self satisfaction from doing a good job. We honestly think this has the feel of a £500 or more shed. That is how high quality and great looking it is. Final Thoughts: We really are impressed by what the 6' x 4' Windsor Somerset Double Door Wooden Garden Shed is offering. The look of the shed is just so lovely that it is easy to forget that behind those good looks is sturdy, reliable and if you plan it right, spacious shed. We feel that at £299.99 this is a very well priced shed and it would also be a shed that could be used in any kind of garden. If you want a shed that offers both style and substance, but do not want to have to pay a huge price for it, then you will struggle to beat this.